I eventually decided against that, though, simply because it's misleading; it suggests that blogging about my travels has indeed diminished the experience for me in some way. Which isn't really true. Blogging has not “ruined” travel for me. But being a travel blogger HAS definitely changed the way in which I travel. On my very first “big” trip abroad (to New Zealand in 2005), I only had a vague concept of what blogging really was. (Come on, we all had a LiveJournal blog in high school, didn't we?) I had a bulky digital camera that ate through two dozen AA batteries in two weeks. And I wasn't even on Facebook yet. It was before the proliferation of smartphones and Instagram and readily-available wifi. Looking back, it was an entirely different world. In the intervening ten years, a lot has changed. Technology has evolved by leaps and bounds; things are possible today that I never even imagined on that first big trip back in 2005. And becoming a travel blogger has definitely had an impact on the way I travel. And, as a blogger, I take things a step further. I don't just want to be connected because it's convenient – I actually require it to do my job. When I'm traveling, I'm also usually working. This means posting photos to Facebook and Instagram, showing people behind-the-scenes glimpses on Snapchat, answering emails, and drafting blog posts when I have time. This all requires being connected as much as humanly possible. Always looking for a spot to work! The downside: Well, it's that I'm always connected. I always have a smartphone, a camera, and usually a laptop with me on my travels. I rely heavily on wifi (gone are the days when I might have booked a hotel room because it was a great deal – now wifi is the number one requirement! ), and am admittedly addicted to having instant access to information, entertainment, and more. I'm not saying that I never disconnect (in fact, I recently went on a digital detox trip where I ignored my blog, email, and social media for an entire week! ), but it's definitely rare. The upside: I get to have a career as a blogger! And, I gotta say, being able to explore the world and make money while doing it is definitely a dream come true for me. To be fair, I still travel based on my own personal bucket list and where I actually want to go – blogging hasn't really affected that at all. But there's no doubt that being a blogger causes me to consider destinations differently. Now, I go places with story ideas in mind, or with a checklist of things to do/see so I can potentially write about them later. I'm also likely to seek out interesting and colorful spots for Instagram photos or a fun Snapchat story. I rarely look at a trip as a holiday any longer, because I know that I'll probably share at least *something* from it with my audience. Just a set of red doors, or potential Instagram gold? The downside: My blog (i.e. work) is almost always on my mind. Even though I might take a break from blogging while on a big trip, things like email and social media are almost always there to keep me busy. The upside: The fact that I may write about a destination or experience makes me pay more attention to it. I ask more questions, get more involved, and sometimes even take notes. As far as travel as education goes, I think I think I actually learn more as a blogger! In case you didn't know, this blog is a one-woman show. I don't have a partner or assistant to help with writing or photography or video editing – I do it all myself! And since the onus has been on me (and only me) to learn how to do everything from SEO to photo editing to email marketing, it means that I've picked up a lot of new skills as a blogger. And one of those has definitely been photography. As a blogger, I don't necessarily take more photos than the average traveler. But I do take different photos – of food, of hotel rooms, of activities that I'm doing. Just in case I need those photos for a post later. 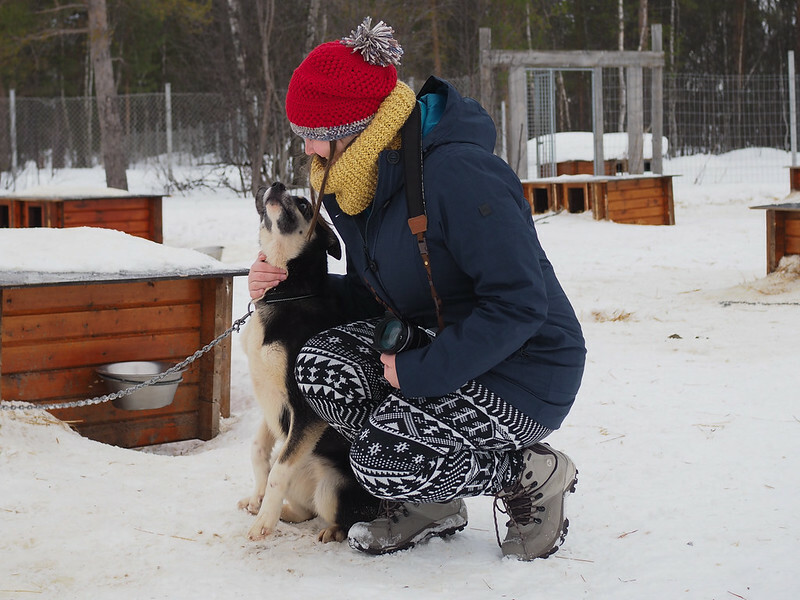 My camera is usually attached to me – even when cuddling sled dogs! Knowing that blogs (and especially travel blogs) are very visual, improving my photography has been something I've actively worked at for years. And working at it has made me fall in love with it. I really enjoy the challenge of trying to capture scenes and moments exactly as I saw/experienced them, and photography has now become a very important part of my personal travel experience. The downside: It's now really, really difficult for me to travel without a camera. I tried doing it on my recent digital detox trip, and realized that not being able to take my own photos actually detracted from the whole experience for me. The upside: It's one more creative outlet that I get to explore and hone. As a travel blogger, I don't necessarily have to always be traveling in order to run my blog (in fact, I travel less than half the year!). But I DO always have to come up with new post/travel ideas – I'm sometimes planning my next trip before my current one is even over. And I'm always seeking out new and unique experiences to share with my audience. I'm a pretty adventurous person by nature, but I'm definitely more likely as a blogger to go out of my way to do something that will make a good story. Whether it's swimming with seals or doing the world's longest zip line or going to the Arctic in the dead of winter, I rarely will say no to a new adventure these days. 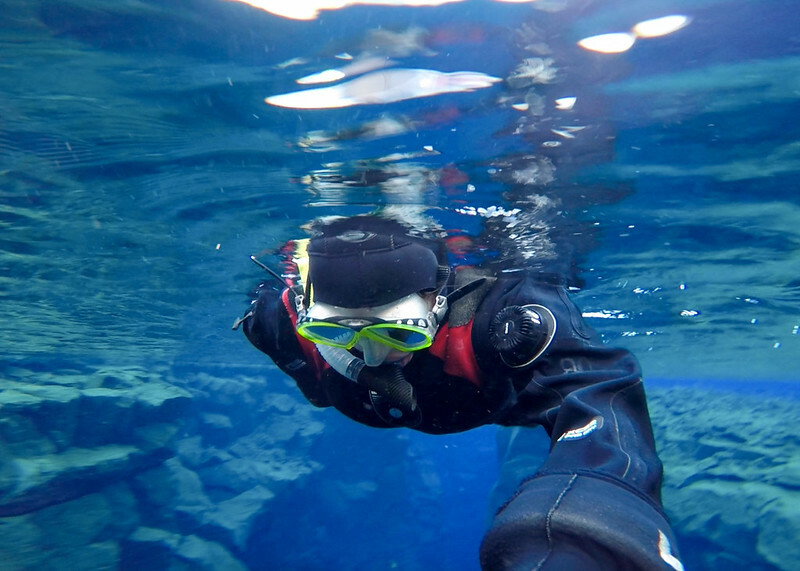 Snorkeling in freezing water between tectonic plates in Iceland? Sign me up! The downside: When you have so many great adventures, it's easy to start taking it all for granted. I try my best to avoid the “been there, done that” attitude, and make an effort to acknowledge how lucky I really am to be able to have this kind of lifestyle. The upside: Awesome adventures, of course! I've tried so many new things all for the sake of getting a good story, and know that it has definitely helped me grow – both as a blogger AND as a person. When it comes down to it, I'm no longer your average traveler. I'm now a travel blogger, and that definitely DOES have an affect on how I explore and experience the world. But, thankfully, I think the upsides outweigh the downsides. And I kind of can't imagine traveling any other way now! So what do you think? 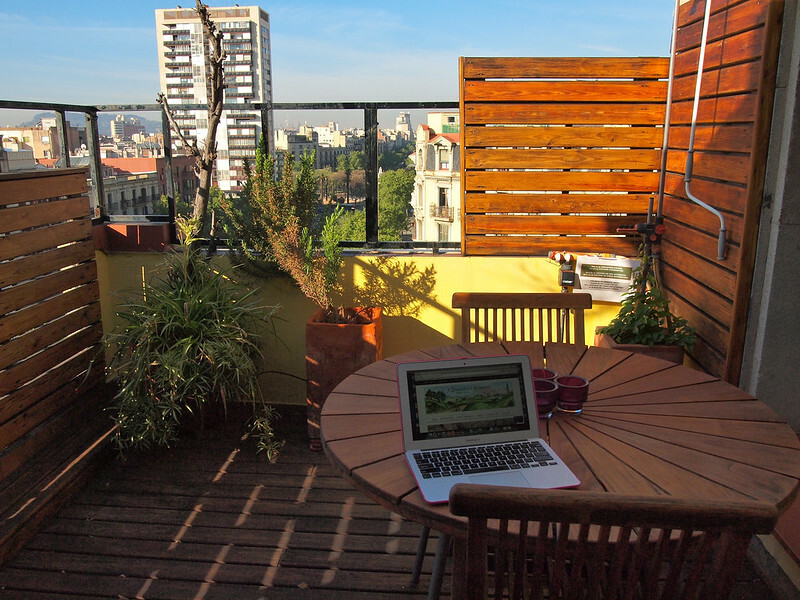 Did you expect that blogging could change a travel style so much? Has anything (a job, an interest, etc.) influenced the way YOU travel? I never really thought about how blogging might impact my travels until recently when I caught myself taking more notes and photos about a place than usual. It’s funny how that works – either consciously or subconsciously! Yes, sometimes you don’t even realize it! I wouldn’t say it’s a bad thing, though, so long as you’re still enjoying your travels! I tend to agree! There’s a certain challenge in trying to capture a moment exactly as you see it, but those photos often end up being my favorite souvenirs! That’s really interesting. I’ve gotta admit, I never really thought about how it would be different traveling as a blogger. I do plan to start a travel blog at one point basically to keep my friends and fam up to date, but I don’t want to make it my job because I could never handle always having to have wifi (because I’d miss out on certain wifi-less places/experiences, and also because I hate technology lol) and taking good pictures. I’m the opposite of you, I always feel like a camera gets in the way of the actual moment. The way I see it I can find pictures of gorgeous places I visit online so if I need to I can put those on my blog! Everyone travels differently, so I can definitely understand your point of view, too! My boyfriend feels the same way about cameras, so he totally doesn’t get it when I say that photography is PART of my travel experience now. Yep! This is all spot on. When I travel these days I’m way more connected than I ever used to be and I’m always taking notes about the places I visit and the questions I get answered. The best part is, though, that I do ask a lot more questions. I feel like now vs. then I have an enhanced learning experience for sure, which is great! Yes! When I compare the trips I take now to the trips I took before I was a blogger, I remember SO MUCH more now! Blogging has definitely made me a more curious traveler. Same here! I love brainstorming post topics while I’m on a trip, and am always excited to go home and write about my travels. Yes, I tend to get all my travel tips from other bloggers these days, too! Being a blogger (and now a travel advisor at a travel agency) has definitely impacted the way I travel! One major thing I’ve noticed is that I tend to dress much more nicely these days! I used to always dress very casually and comfortably when traveling (plain t-shirts and tank tops with casual pants or shorts), but now I tend to dress more fashionably and professionally. For one thing, I’m representing both my personal brand and my agency when I travel abroad, and I’m also always thinking about that next cute Instagram picture. Sad but true! That’s one I didn’t even think about – but it’s definitely true! I’ve been making an effort to get more photos of myself when I travel (sometimes I go on whole trips and never get one picture of ME), but knowing that I’m going to be in photos definitely makes me think about what I’m going to be wearing! Hi Akatuki! I agree with you that blogging changes the way you travel. Most of all, it’s no longer vacations, as you say. It’s difficult to “forget the world” and be on your own as it used to be. We are always connected and places/people are always viewed through a “potential for social media sharing” perspective. Nevertheless, I still enjoy it. Perhaps even more than before. I love the fact that now I can reach more people with social media and share with them my experiences of places they haven’t been – and maybe never will. I totally understand what you mean – and agree! Some people think that being so connected is a bad thing, but I just look at it as a new/different way to travel. I, too, love sharing my adventures with people in the hopes that I can inspire others to get out there and see the world. Having identified all of these, though, I really wouldn’t change a thing! Great post Akatuki! Since I started blogging, I’ve noticed a few changes here an there but it hasn’t affected me too much when I’m on the road. It’s mainly because I’m not blogging as a business so I can do everything I used to do. But I do take a lot more notes from my trips than I used to, just so I have more to share with others. Definitely agree with you that blogging does make you want to try new experiences. Haha, disconnecting completely is definitely a challenge – but it’s good to be challenged every once in a while! That’s awesome, Kelly! Traveling (and blogging) has definitely helped me learn to not sweat the small stuff as much – or, like you said, to just brush it off and turn it into a blog post later! What a great post! I love that you get to travel around for work! And going to the Arctic sounds amazing – definitely on my bucket list! Yes, I’m pretty lucky to get to do what I love AND have it be my career. That doesn’t mean there aren’t any sacrifices at all, but the good far outweighs the bad. I’m still just “hobby blogging” but I totally get this – I’m always thinking about posts and for my upcoming 2 week trip to Asia, I have an outline of potential posts I plan to write about when I get back. Since it’s just a hobby for me, though, the laptop stays home! The other way that I travel a bit differently, or maybe not so much, but I work full-time and travel 4 weeks a year ( some weekends) – I rarely will visit the same place twice because I have a lifetime of destinations I’ve yet to get to. So, when I visit a place, it’s with the full intention of never going back so I try to make sure I can see as much as possible in case I never make it back. Ah, yes. And traveling with that, “I’ll probably never be back here” attitude definitely has an impact on how you travel, too! This is great to read. I’ve also wondered if beginning to travel with blogging in mind will decrease the enjoyment factor. I’m happy to read you’re still finding mostly upsides! I still definitely love to travel (and I also still really love blogging)! Great article Akatuki. As a new to me blogger, but not new writer, I’ve always thought about the story and it’s hard not to. However I do find I take more photos (especially of food) and spending time thinking about how I can blog or something is on the mind. But I do like that I’m more engaged with the destination and that really is what it’s all about! Sounds like you feel the same way I do, Tonya! And I agree – being more engaged with a destination or experience is never a bad thing. I know what you mean about feeling antsy if you can’t document parts of your trip! I’ve definitely felt that way, too. I’m loving your blog Akatuki because I really like to know the stories of the journeys of people. Be blogger traveller will be amazing. Success!